The Nolan Company has developed air-powered and electric-powered derail operators for our new line of SD Series Sliding Derails. Operated by remote control, Model AOD-1 (air-powered) and Model EOD-1 (electric-powered) derail operators can position a derail ON or OFF the rail with just the turn of a key switch. Used to control overhead plant doors to prevent unauthorized equipment from entering the protected area — closing the plant door remotely sets the derail protection in service, prohibiting unauthorized rolling stock from entering plant/work area; opening the plant door remotely removes the derail protection from service permitting authorized rolling stock to enter protected area. Used to initiate a number of warning devices such as sirens, lights and horns in the protected area. Built-in indicator lights and flashing blue strobe light on AOD and EOD units meet FRA and OSHA compliance laws. Simple, straightforward design, together with thorough installation instructions, gets you set up fast and efficiently. Connecting rods are included. Solid all welded 1/4″ and 1/2″ steel weather resistant construction withstands harsh working environments and temperature extremes — and ensures low maintenance and long service life. Can be used with any sliding derail available on the market today. Control boxes (sold separately) can be set up in separate locations or used together — to control one unit to multiple units from a single location or many locations. Includes a power-off locking feature. 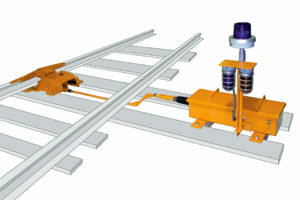 NOTE: Sliding derails and control boxes are sold separately from the automated derail operators.